Yea, today is Tablescape Thursday. This is the day we get to play with all of our dishes, such fun. This wonderful event is hosted by the gracious Susan @ Between Naps On The Porch. 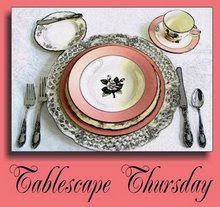 Be sure to see another one of her gorgeous tablescapes and a list of all the other participants. I know you will be in awe at the gorgeous tables. 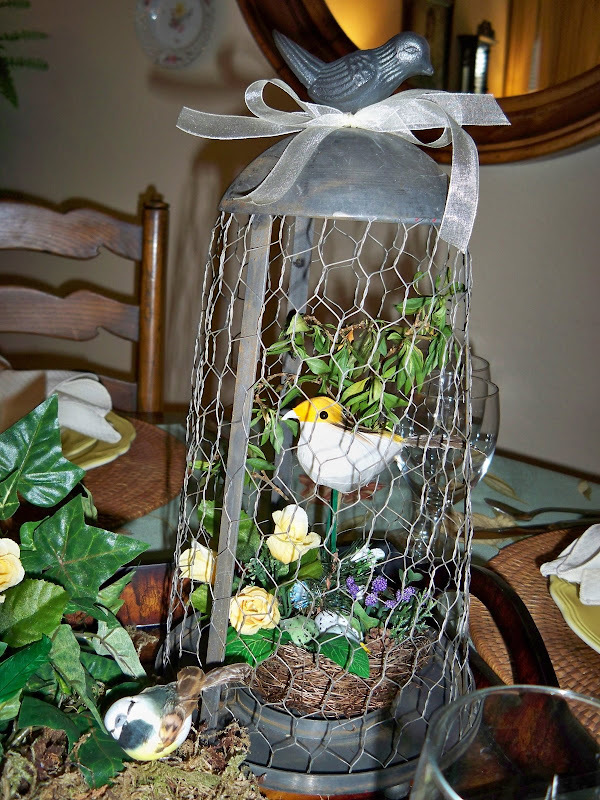 Today I am using the fun Chicken Wire Lantern Cloche that I found at Ross. I've decided to do a little vignette inside. I'm practicing for the upcoming "Cloche Party" in Sept. Don't forget to round up all of your cloches and be prepared to join the party. I've used a tray that I also found at Ross to hold my little vignette. 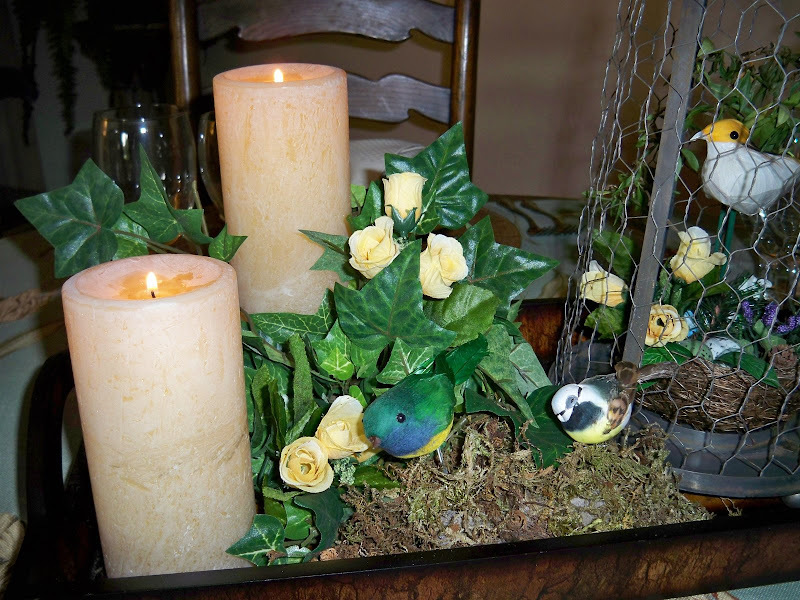 A branch from the yard, a birdnest, a few tiny roses and a sweet little bird sitting in the branch. Looks like the little guy is watching over his eggs. A couple of his bird friends are playing in the grass amid the ivy and roses. Two candles for ambiance and the tray vignette is complete. It's already been up to 116 here, so I wanted to bring a little of the outdoors in. It is just too hot to be outside. An overhead view of the table. I used a tablecloth with tulips to help bring even more of the outdoors in. 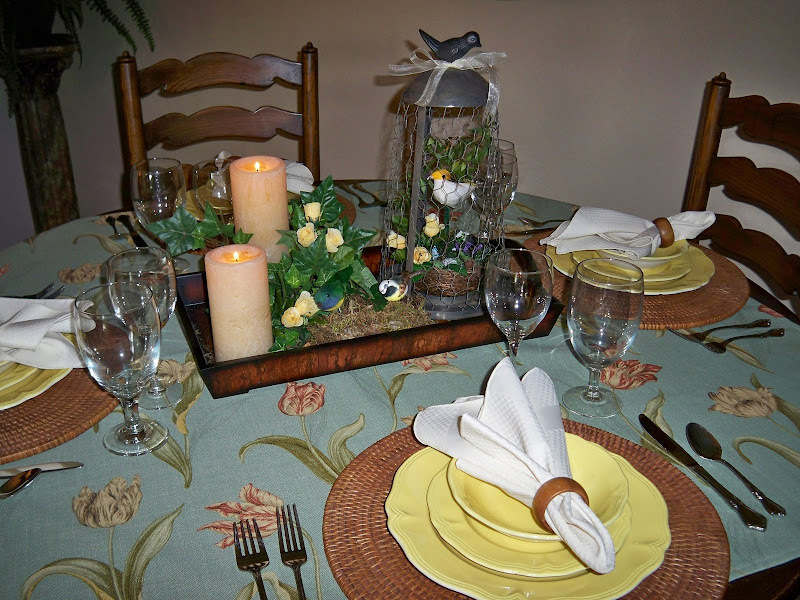 Each place setting is set with Dollar Tree wine and goblet, everyday Rogers flatware, napkins from GW, Yellow Federal dishes from GW and rattan place mats that I've had for years. Thanks so much for stopping by. Practice with those cloches if you have one, or continue the hunt if you don't. Our next party is just a little over a month away. Don't forget that apothecary jars qualify too. I can hardly wait to see everyone's creations. It's been a really busy week and I havn't been able to make all the rounds and thank everyone for your wonderful comments about my guest post with Kathysue. I was so thrilled to have her as a guest and she was really tickled with all the sweet and gracious comments. Thanks for giving her such a beautiful welcome. So pretty! My goodness 116! That's firecracker hot! stay cool - thanks for your sweet visit today - I always smile when I see that you've stopped by! Hi Marty, This is beautiful. 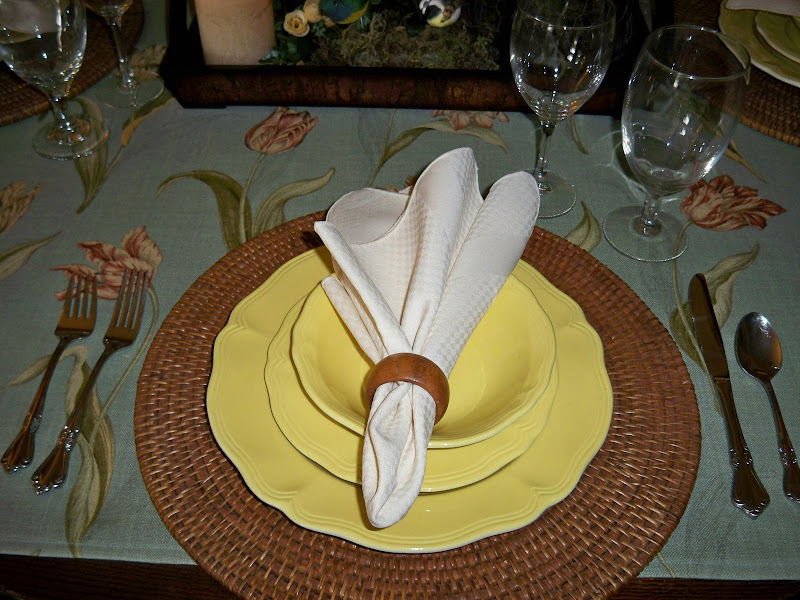 I love the pale yellow dishes with the aquamarine of the tablecloth. The cloche on the tray is so pretty. You have me looking everywhere I go for these now!!! Your table is just divine - thanks for sharing. Hi, wow it is hot there! I love the wire cloche! I missed the last party! What date will the next one be in September? I just adore your yellow dishes! I been hunting a perfect set! One day! The candles look great on the tray with the cloche! The birds are so cute!! PS I do love Daddy visits, he's going on 83, I do not get to be with him alone very much. So this was very special day. Oh, and its my daughter that lives beside me. Let me know the date of the party! For I will be in surgery, mid Sept. I might can post and have someone to add me if it then! Marty this table is so pretty! I love that cloche!! Oh my goodness, Marty, I've been searching far and wide online for those yellow dishes ever since you posted them once, and you got them at GW! I have been in love with those plates! I love your little cloche too. I've been on a hunt for those also, for September. I've got to step it up. Fall can't come soon enough! Oh' I love it, you never dissapoint! I love the table cloth or fabric you used! SO PRETTY with the birds too! I just adore your wire cloche and the way you arranged it. Your yellow dishes are gorgeous. The placemats you have shown are so pretty too. ~Perfect and fun! Marty, Your table is just beautiful. I love those yellow dishes. The whole table just looks so inviting. Thanks for all your wonderful comments on my postings. I'm so excited to hear you say Apothecary jars count too for the Cloche party,as I do not own a cloche!!! So I just might jump in and join the party in Sept.!!YEAH!!!! I love the outdoor look of the table, very fun and inviting!!! I love your yellow dishes, I have fiesta dishes in about 5 colors and yellow is one, however yours have so much more character!!! I need to hit Gw way more often, there is not one real close to me, OOOOPS--I forgot there is a new one out by me!!!! Plan for Thursday, go to GW!!!! ALRIGHT! I need an excuse to get a couple more cloches! lol! I am in love with your tablecloth! Bless you heart...116 degrees!!!! I purchased a apothecary jar today at TJMaxx on clearance for 10 bucks....so I will be ready for the cloche party! Love all of your little bird friends. Wish they could fly over to TN for a visit....love little birdies and bunnies!!!! You know I love this with the pretty yellow dishes, and the yellow roses! Thanks for reminding me to work on my cloche, Sept will be here before we know it! Love your yellow dishes - so sunny. The tablecloth, oh so pretty! What a pretty and summery table you have for us. Just beautiful. I really love your yellow dishes. The centerpiece is just precious. I had to miss the last cloche party..bwaaaaa... but am hoping to be able to join in on the next one. As soon as you get a button up for it, I'll put it on my sidebar..
Marty, your table, "mwah!" so pretty! Love the wire cloche and I will be ready in September, I just know, I'll find a cloche by then or come up with one that can pass as a cloche. 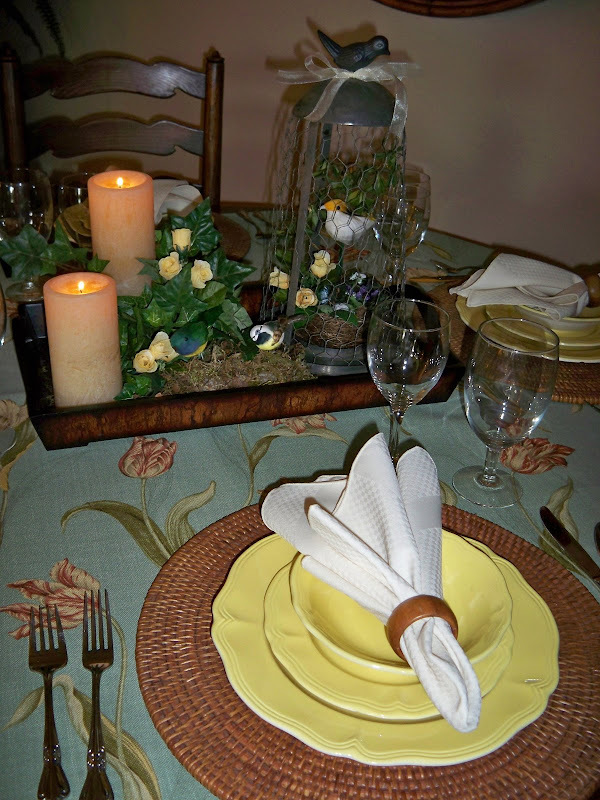 Those yellow dishes are such a beautiful shade and your centerpiece is just darling! Great use of your wire cloche! Your tablecloth goes so well with everything too. This is so outdoors and summery, Marty. The cloche is so cool--I still don't have one (or an apocothary, or those birdie s&p's). Your tablecloth is so pretty. Love the yellow dishes as well. Wow, that is hot outside!! Very pretty table, great job! Marty, this is so pretty. The wire cloche and birds are so special and make me smile. Your entire table is like a walk in the garden. Just lovely!!!!!! As always, I love your tablescape. Are those new dishes? Very pretty, they look so summery...is summery a word...Oh well, they make it look like summer has arrived. Your cloche vignette is perfect. Love the little bird watching over the eggs. Your yellow dishes look great with all of the outdoor touches. Stay cool! love the yellow dishes on the wicker chargers ! Very cute Marty! That cloche. What a lucky find at Ross!! I love it when I find a treasure and walk out of the store just beaming with glee! It is HOT where you are. OK, so I'll stop complaining about our 102. But this weekend it's supposed to really warm up even more - UGH! I am such a sucker for yellow. Those dishes are just wonderful. What a nice post. Everything just looks "COOL". HA! LOVE all the little birds... adorable! So Pretty! I really like what you did with your cloche! Hey Marty! 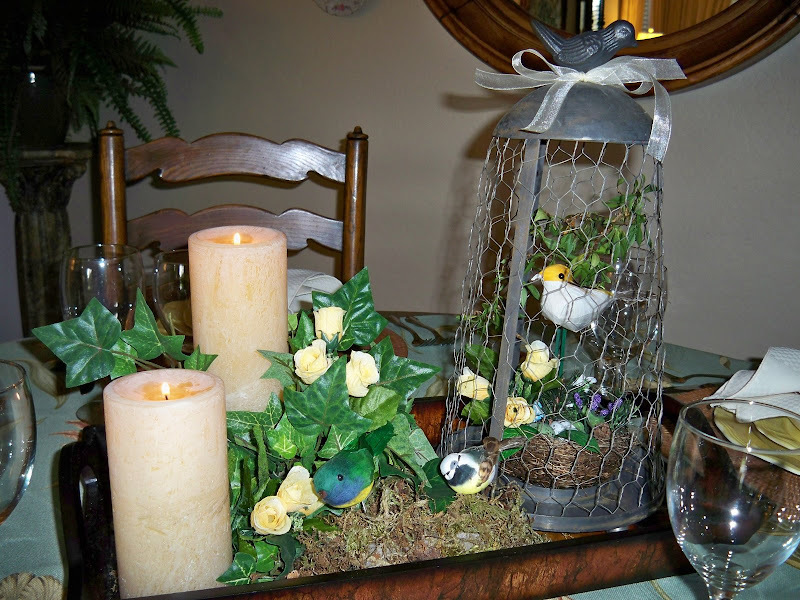 Love the centerpiece especially the bird cage...so cute! Love these yellow dishes. Makes for a sunny table. WOW ,you've done it again . An outstanding tablescape that looks so cool and refreshing .I felt like maybe spring time would come again. It is almost to hot to do anything these days. I really do like the colors you used today . How pretty! And whew! 116 degrees sounds excruciating. I remember traveling and staying all night in YUMA, AZ, and it was 112 at midnight.. I couldn't believe it! Love your stylin' ways. Hugs. Your latest is charming! It's fun and filled with positive energy and, as others have said, the yellow dishes are wonderful -- so pretty! I'm glad you decided to play inside --- 116!!!! I can't imagine what that must be like! Sweet tablescape, looks so summery, I like those pretty yellow dishes. I agree ,to hot to be outside !! 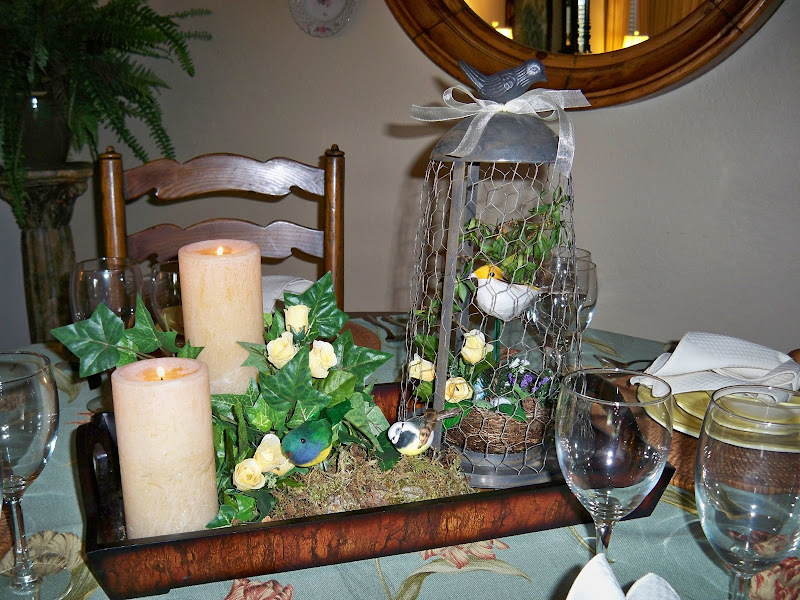 Very Pretty Marty ... Love the new Chicken Wire Lantern Cloche and the Yellow Dinnerware! Thank you so much for always dropping by and leaving such sweet comments. Marty, Thanks for coming by. Your tablescape is gorgeous. I am really jealous of the wire cloche. I keep looking for one. Good job, Marty. This post could almost be Outdoor Wednesday. I need your yellow dishes...Oops, I mean, they are so lovely! What a pretty table, love the cloche too! Beautiful table Marty!! Love that yellow! Stay cool!! Beautiful table as always. I love the gentle yellow color or your dishes and of course, the cloche is to die for. How lovely as always Marty. Wish I had a cloche to be part of your fun sharing. Maybe I'll look for one. How exciting Marty! So glad you are having another one in September! I love that time of the year! Putting your button on my side bar! P.S. Marty I am having a difficult time saving the button to my computer. When I go to my pictures it just shows a blank picture. Tried three times. I will keep trying!